Beautiful! I love all the lovely little bits in there - yum! I have never had fresh mangosteen, although the juice is yummy! wait... where do you live? my understanding is you can't get mangosteen in the united states... i wish i could! 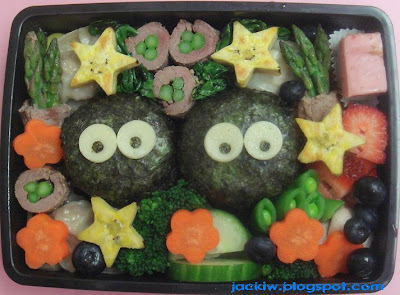 this bento is beautiful... so complicated! I'm glad you like the bento! I thought it turned out pretty cute!